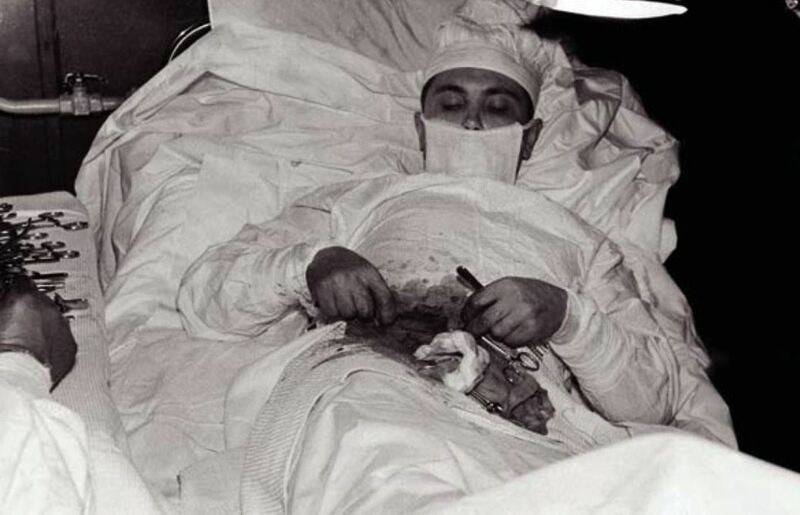 It shows Leonid Ivanovich Rogozov, a Soviet doctor who in 1961, while stranded at an Antarctic research station, succeeded in taking out his own appendix. There is a surprisingly long history of patients operating on their own bodies. 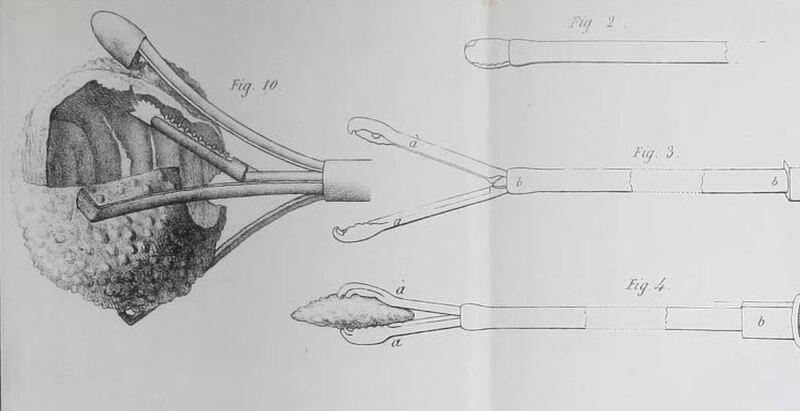 One case that I’ve previously written about was that of Colonel Martin, a French soldier who in 1782 managed to treat his own bladder stone using an instrument of his own invention. I am 26 years old: while still young I was afflicted seven times by bladder stones. For reasons which are not well understood, bladder stones were far more common two or three centuries ago. They also affected much younger patients than would today be considered typical: doctors were frequently asked to treat children of seven or eight. This young man was certainly unlucky to have endured the condition so many times, but his experience was far from unique. 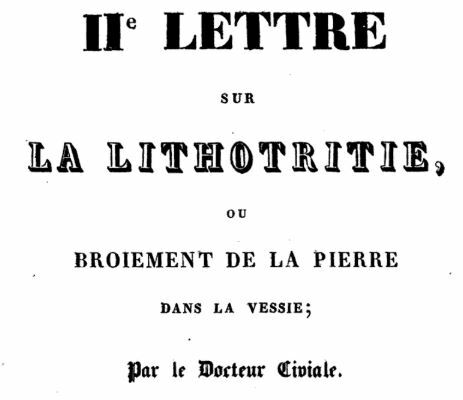 In 1816 I was cut for the stone for the first time in Lunéville; the calculus which was removed was broken during its extraction. ‘Cutting for the stone’ was the dreaded operation of lithotomy, which entailed an agonising incision to remove the concretion of minerals from the bladder. It often ended fatally, since there was a significant risk of infection. De Maldigny was fifteen when he endured this first procedure, which was not successful in relieving his pain. The following year, after continual suffering, I submitted to the procedure again and two large stones were removed. Imagine his feelings on realising that he had to go through the ghastly experience a second time! This time, however, he was more fortunate, as the operation resulted in a total remission of symptoms. His relief was short-lived, however, and after a few months he started to notice a burning sensation in his bladder, and – more worryingly – pus in his urine. In 1818 I was cut again in Nancy; the operation, which was very difficult, lasted more than half an hour, and was followed by serious complications. In an era when surgeons prided themselves on their speed, half an hour was a long – and agonising – procedure. It is probable that the previous operations had caused adhesions, scar tissue which made surgery more complicated. The inflammation of the bladder became very violent, and soon spread to the abdomen; the third day after the operation, I had a very abundant haemorrhage from one of the arteries which had been cut; this loss of blood was so considerable that it made me fear for my life. …and it was only after a copious vomiting of blood that I began to recover my health, although then I had been given up by my doctor, who retained not the slightest hope of my survival. This terrible operation, the result of which was almost fatal, held me back for more than two months, and it was only long afterwards that my recovery was assured. You might think that after this experience the young man (he was still only 17) would be reluctant to go under the scalpel ever again; but not a bit of it. In 1820, I was operated in Strasbourg. I was relieved of a small stone: I recovered quickly. In 1823 I was operated on once more. The calculus was medium-sized: I was not confined to bed for long. In 1824 I rid myself of a concretion the size of a nut. Fixed in my resolution, after having made the necessary preparations, I placed myself before a looking glass; I raised the scrotum with the left hand, which stretched at the same time the skin of the perineum, and at that part where the operation for the stone is generally performed, I forced in perpendicularly the point of a bistoury, until it came against the stone which was enclosed in the neck of the bladder. A bistoury is a type of surgeon’s knife. Try to imagine forcing one into your own perineum; and when you’ve finished wincing, read on. This puncture made, I rested a few seconds, then I enlarged the opening in the integuments, and carried my finger into the wound, thinking to touch the stone, but the point of the bistoury had only divided the part sufficiently far towards the exterior, and therefore the division was not perfect. After a momentary repose, I carried the instrument again into the wound, and completed the section. Then with my index and middle finger I searched for, and soon succeeded in extracting a calculus of about the size of a large nut. I hope he kept the stone – such a souvenir would be a great thing to show the grandchildren. The operation over, the urine flowed in abundance. I dressed the wound with lint, dipped in an emollient decoction; being perfectly relieved from my pain, I fell into a sound sleep. On the following day I was as tranquil and cheerful as if I had never suffered. It seems that he was lucky this time to avoid infection, since he made a perfect recovery. Many physicians, my friends and colleagues, and a great many persons whom I do not know, surprised at such news, flocked to my house to assure themselves of a fact which appeared to them truly astonishing. M. Clever, since that time, has been gradually getting well, and is now perfectly cured. The calculus which he extracted, had for a nucleus a bit of prepared sponge, which was left in the wound made by a former operation. The stone had formed around a piece of sponge carelessly left in his bladder by one of his previous surgeons! Today we would call his condition iatrogenic – caused by medical intervention rather than by a natural disease process. In 1827 and 1829 the disease reappeared and, for the seventh and eighth time, the patient resigned himself to operations. These last took place by lithotripsy, then quite a recent invention, and which he would only run the risk of undergoing after careful study. The operation of lithotripsy, pioneered by Jean Civiale, was a far less invasive technique which quickly proved its worth. Civiale invented an instrument with a long, thin handle and grabbing jaws, known as the lithotrite. This was inserted through the urethra and into the bladder. The surgeon then seized the bladder stone in the instrument’s jaws and crushed it. The resulting fragments were (in theory, at least) small enough to be washed out with the urine, doing away with the need for a painful and dangerous incision. Civiale himself operated on Dr de Maldigny: it was not straightforward, since he had to repeat the procedure several times over successive days in order to remove fragments of calculus too big to be evacuated naturally from the bladder. But eventually, it seems, he effected a cure. Dr de Maldigny was so grateful to Civiale that he presented a paper at the Royal Academy of Sciences extolling the virtues of the new operation. But was de Maldigny’s eighth operation his last? He lived for another fifty years before his death at the age of 77, so it seems quite likely that his old condition recurred at some point – but I can find no evidence of any further surgery. The doctor pursued his medical career at least until the 1830s, but then his interests seem to have evolved considerably. In the second half of his life the Baron became a prolific dramatist, and his comedies were seen on the stages of Nancy and Paris. He was fascinated by spiritualism, and wrote trenchantly in defence of the idea that the supernatural is all around us. In 1865 he even published an opera (Swedenborg, based on the life of the Swedish theologian Emanuel Swedenborg) which he claimed had been dictated to him by members of the spirit world. 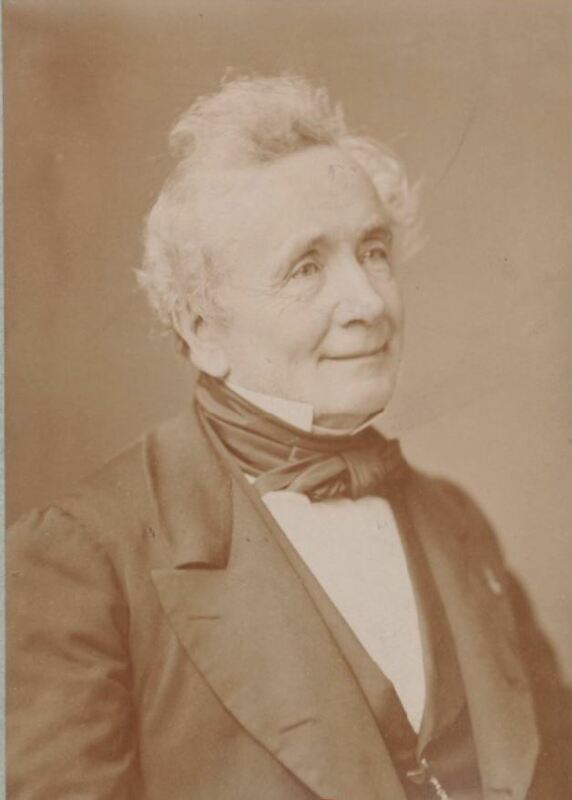 Charles-Auguste Clever de Maldigny performed major surgery on his own body and acted as spiritual medium to musical ghosts. How many people can say the same?